High quality tuna from a bright coloured and juicy piece of tuna steak, which is not chopped or dissolved; it is supplemented by a high quality sunflower oil. The oil helps to emphasize the great taste of tuna. The fillet doesn’t “float” in the oil, therefore, it isn’t necessary to pour the oil off before making salad, snacks or other delicacies. 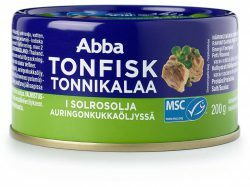 Abba tuna in oil is the best choice for making salad. Packaged in 200 g can. Expiration date: 60 months. Catch: tuna (Katsuwonus pelamis) – Indian Ocean. 100 g of product contains: energetic value – 800 kJ (190 kcal); 10 g fat (from which: 1.3 g saturated fat acids); 0 g carbohydrates (from which 0 g sugar); 26 g proteins; 1 g salt.